This charming bird is hoping you'll invite him over for coffee. This little toucan is both a sweet coffee break companion and a one-of-a-kind piece of art. 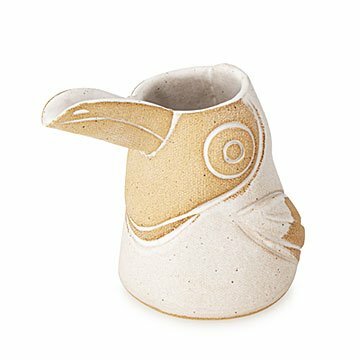 Ceramicist Linda Hsiao not only designed the little charmer, but she also makes him by hand, so each one has subtle variations that give him his own, unique personality. The pitcher is perfect for adding milk to your coffee or tea, but it's also happy to pour sauces at dinner time, or sit on your countertop holding wildflowers. Whether you're an animal lover or just a lover of a warm cuppa, it's a delightful gift to give a thoughtful friend, hostess, or mom. Handmade in Los Angeles. Linda Hsiao may have studied industrial design at the Pratt Institute in Brooklyn, New York, but her work as a designer has taken her back—both physically and creatively—to where she grew up: Orange County, California. After returning to the West Coast, Linda began to explore the hands-on nature of ceramics, creating one-of-a-kind projects that draw inspiration from the natural landscapes of her childhood. Now, she brings together both her artistic impulses and her product design training in objects that are both functional and beautiful.